ClickFORMS Membership Levels | Bradford Technologies, Inc.
AppraisalWorld Log-in required. Joining AppraisalWorld is free and exclusive to appraisers. Membership prices are effective January 1, 2019 and are subject to change without notice. All subscriptions are based on a 12 month commitment. Both Monthly and Annual renewals are automatically charged. Failure to renew or cancellation of membership will deactivate ClickFORMS and you will not be able to open the application. Additional services are available separately from the online AppraisalWorld store or by calling your sales representative. Added User packages are available to add to accounts with a master account membership of Gold or higher. Added User packages may be any Membership level. Discover all the efficiency and productivity that's possible when the appraisal software you're using is simple and intuitive. Easy to use doesn't mean that ClickFORMS lacks the features you want and need. Sophisticated features are built right into ClickFORMS. 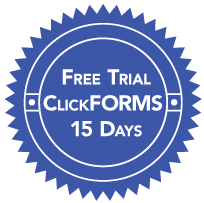 Try all the time-saving features of ClickFORMS and get free technical support for 15 days – no hassle, no risk, no obligation. ClickFORMS is ideal in a multi-appraiser office environment. ClickFORMS' ease of use, affordability and flexible, trouble-free installation translates into an appraisal software solution that is highly efficient and profitable. Your Assistants Use ClickFORMS for Free. Appraisal office assistants can use your ClickFORMS membership at the same time without additional cost. ClickFORMS is the most intuitive appraisal software available. Reduced training means that appraisers of any background can quickly become proficient and productive team members. ClickFORMS does not require complex dedicated network installation and can be installed on multiple machines in multiple locations. No need for an expensive IT infrastructure, just a local network or internet connection. ClickFORMS is affordable. Whether adding just a few additional licenses in an office or hundreds across multiple states, we have affordable plans that we can tailor to your needs. Bradford Technologies can customize ClickFORMS addendums and forms for your specific appraisal business.